NTT Inc. - NFPA 70E 2018 Changes: What You Need to Know! 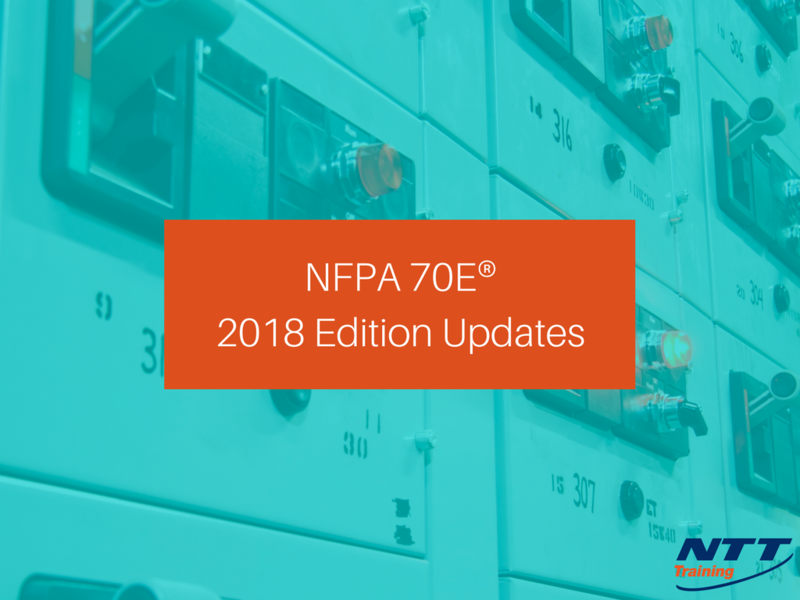 NFPA 70E 2018 Changes: What You Need to Know! Every three years the National Fire Protection Association (NFPA) releases an updated version of its NFPA 70E: Standards for Electrical Safety in the Workplace. Each new edition brings new requirements and changes for electrical safety to assists companies and organizations in complying with OSHA 1910 Subpart S and OSHA 1926 Subpart K. Let’s take a look at some of the anticipated changes to the standard and how you can prepare your business and workers for them. Keep in mind; these changes are not yet official. The exact language, wording, and impact of NFPA 70E 2018 Edition may differ from what is provided below. It’s important to remember to check with the official release to ensure you are compliant with all guidelines and standards. New changes likely include an extension and further explanation of job safety requirements. Some of these changes are focused around job planning and take place prior to even starting a job. Electrical Construction & Maintenance Magazine suggests new requirements will be laid out to ensure the person performing the job is qualified, the job is properly documented for health risks, including shock risk and arc flash, and all procedures and precautions are taken. In addition to planning electrical work, reporting incidents may have also been altered. An important vocabulary change has been made that should be noted. An “accident” when referring to an instance of an electrical issue involving personnel is now referred to as an “incident”. All incidents should be reported, not just those that resulted in injury. “Close calls” are also to be reported and will require an investigation. Plans for the NFPA 70E 2018 edition indicate that shock and arc flash risk assessments will be required for all electrical jobs where relevant. This means a qualified individual will be required to evaluate a job for arc flash and shock risk as part of the planning phase. Once the risk has en evaluated, there are several new control measures, which can be applied to minimize the risk to personnel. These methods include eliminating the hazard completely before starting the job, the use of personal protective equipment (PPE), and substituting safer equipment for working in potentially dangerous spaces. While PPE is commonly used in a variety of work places, the 2018 Edition of NFPA 70E is said to be working to clarify which type and quality of PPE is recommended for which job. It requires manufacturers to provide information regarding care, arc ratings, and other important information that can help workers decide which piece of PPE is right for the job. This requirement is trying to standardize the market expectations so that there is no doubt or confusion over which piece of PPE will provide protection for workers and in which working condition it would be required. It is also to ensure quality. Electrical workers will know a certain rating will provide the protection they need, even if their business moves to a different PPE brand. Electrical Safety Program: A documented system consisting of electrical safety principles, policies, procedures and processes that directs activities appropriate for the risk associated with electrical hazards. Fault Current: The amount of current delivered at a point on the system during a short-circuit condition. Fault Current, Available: The largest amount of current capable of being delivered at a point on the system during a short-circuit condition. Many other vocabulary terms are being considered for changes as well. Some differences might be subtle, but it provides a more precise reading of the standard. As well as additions to the standard, there will also be corrects and revisions. For example, an emergency criteria, Annex H.2 and associated table H.2 both contained errors or omissions and will be corrected with more accurate, detailed information. Looking for More Information on the NFPA 70E 2018 Standard? NTT Training offers the ONLY two day, “Hands-On” skill based seminar that covers everything you and your staff need to know about the significant changes being made to the NFPA 70E while also providing hands on demonstrations and workshops to workers. For more information about a training session, either on-site or at a public course, please contact us. Please Note: This article is for informational proposes only and does not contain every change in the NFPA 70E 2018 edition. Further, since the final version of NFPA 70E has not yet been released yet, as of the date of this article publishing, additional changes are likely. Therefore, please refer to the final NFPA Published version for a list of all final changes to the standard.